MEDUSA4 offers a wide range of tools for creating lines and closed shapes. 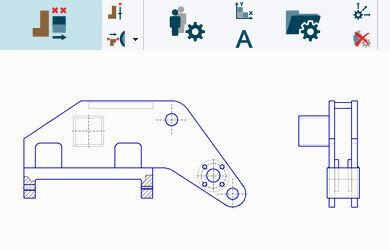 When creating a new shape, users can adjust settings in the dashboard to determine the line style and line type as well as line color and thickness. 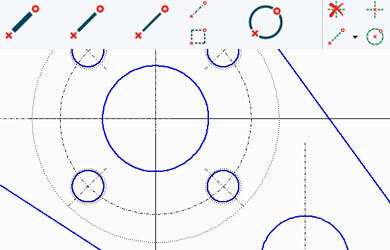 All closed geometries can be created as 2D feature. This mode allows the shape and center lines to be grouped together. In principal it is possible by using all the tools, which are used to create closed geometries even you are in 2D feature mode. 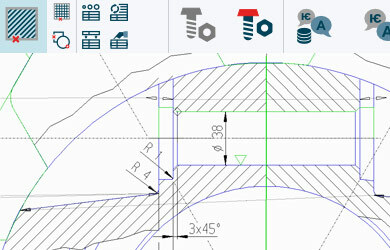 The smart drafting facility in MEDUSA4 provides the means to quickly and easily generate geometry without the need for construction lines prior to drawing. The Smart Drafting Tool allows construction lines to be automatically inferred between points created, and displays them dynamically as the cursor moves inside the drawing area. As users draw their geometry, context sensitive information fields dynamically display segment length, angle or radii information. Intuitive pop-up menus and keyboard shortcuts, as well as visual representations of relationships between current and last lines (e.g. perpendicular/parallel) further speed up the design process. In MEDUSA4 an area of a drawing can be covered with a colour, regularly spaced lines, known as crosshatching, or with a pattern of predefined symbols, known as stippling. The crosshatching tool allows you to cover an area of a drawing with a regularly spaced pattern of lines. The style of the crosshatching can be edited by changing its properties. The stipple tools allow you to stipple an area with a symbol. With the tool a solid pattern of symbols can be created, with no spacing between the symbols, or the spacing between adjacent symbols can be specified. With MEDUSA4’s 2D modelling functionality, orthogonal views within a 2D drawing can be quickly produced from the minimum of geometry. Once an initial view is created, using existing drafting facilities, orthogonal views of the geometry can then be created contained in the initial view. The following modelling operations enable you to produce orthogonal views from an initial geometric view: Profile extrusion, Shaft volume of revolution, Sectioned shaft volume of revolution, Sectioned hole volume of revolution, Volume of revolution end view and Edge projection. MEDUSA4 has a large number of adjustment tools that can be used to change the shape, either while drawing it or later on. These are either shown in a context-sensitive way when a line is edited in the dashboard, or are available in the ribbon menu. In addition, there are several dynamic adjustment tools available to users, which they can use to move line sections or individual segments of a shape. With grouped lines, MEDUSA4 allows users to move segments that are included in this line type. SMART Edit was designed to offer many of the capabilities of constraints-based and parametric (variational geometry) systems, without the need to define a full set of constraints. The tool allows you to edit any drawing directly, without using a sketch. 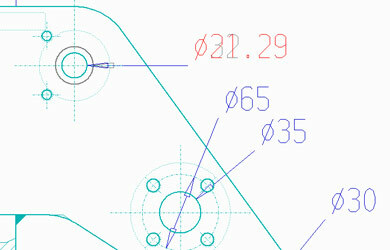 You can apply SMART Edit to imported data (such as DXF files), newly created geometry, or your existing designs. Simply select and drag lines, or enter precise values for sizes and positions of geometric elements to effect change dynamically. 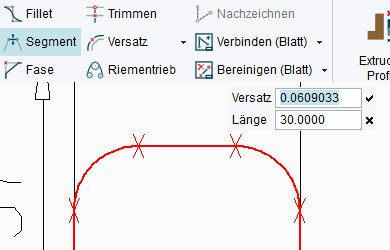 Alternatively, drag or edit existing dimensions to create the correct geometric changes. SMART Edit lets you edit lines more intelligently than just points in lines, because it draws its conclusions based on the dimensions you have provided, deducing your intent for the geometry as a whole. SMART Edit even handles overdimensioned drawings with ease. MEDUSA4 offers the option of using line styles, and adapting them to company-specific requirements. A line style is a collection of one or more line properties. For example, a line style may specify the line type, color and thickness of a line. Styles allow the Administrator to define and name a set of element properties, making it easy to develop a range of corporate styles, and automatically enforce company standards for layering, use of colour and line type. 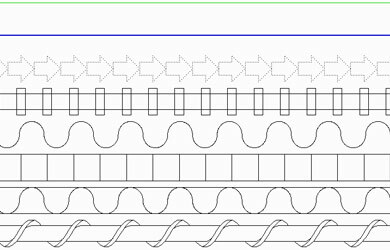 The available line styles include standard lines and decorative lines, with additional characteristics like width, design spacing, width factor and slope. MEDUSA4 provides several possibilities to support the creation of drawings including grids. 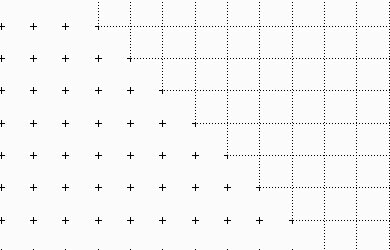 Grids are sheet overlay data consisting of grid points connected by lines. These lines are no real lines but used for visualization only. 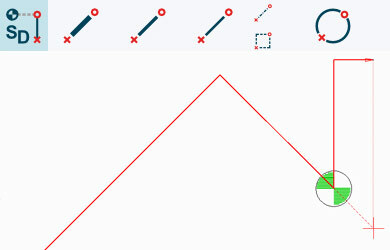 Grid points help you to create and position elements on a drawing, for example to align geometric and text elements, but grid lines are present purely as a visual aid. The grid line style is defined by Color, Type and Thickness.